What happened to network television in the 1980s? How did CBS, NBC, and ABC lose a third of their audience and more than half of their annual profits? Ken Auletta, author of Greed and Glory on Wall Street, tells the gripping story of the decline of the networks in this epically scaled work of journalism. He chronicles the takeovers and executive coups that turned ABC and NBC into assets of two mega-corporations and CBS into the fiefdom of one man, Larry Tisch, whose obsession with the bottom line could be both bracing and appalling. Auletta takes us inside the CBS newsroom on the night that Dan Rather went off-camera for six deadly minutes; into the screening rooms where NBC programming wunderkind Brandon Tartikoff watched two of his brightest prospects for new series thud disastrously to earth; and into the boardrooms where the three networks were trying to decide whether television is a public trust or a cash cow. 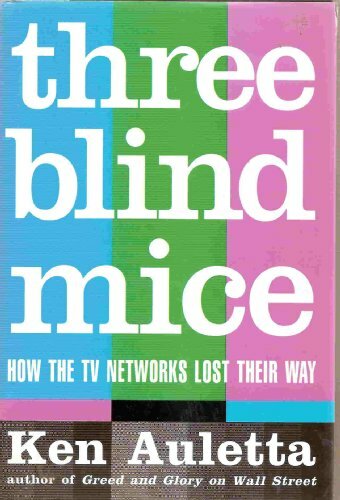 Rich in anecdote and gossip, scalpel-sharp in its perceptions, Three Blind Mice chronicles a revolution in American business and popular culture, one that is changing the world on both sides of the television screen.